With our huge selection, your favorites are always available. Come in and check out what’s in stock, or use the “Brew Thru” for fast pick up without having to leave your car! At Lamb Beverage, we are proud to serve our commercial accounts with the highest regard for customer care. We carry a wide variety of domestic, import, and craft beers, as well as a full compliment of soda, mixers, energy drinks, snacks, and ice. We are pleased to now distribute these fine craft beers. Click on the Wholesale tab for more information on these breweries and our current inventory. Supplying All Your Favorite Brands: Domestics, Imports, and Craft Beers (Cases, 1/6 and 1/2 kegs). We carry Mixers, Sodas, Energy Drinks, and are always stocked with a wide selection of domestic, craft, and hard-to-find kegs. 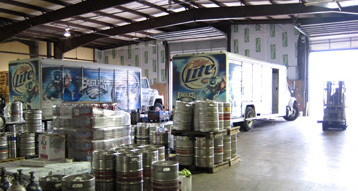 By storing perishable products, providing access to a diverse selection of brands at different price points, and hiring local citizens specializing in helping sell beer and promote regional businesses, Lamb Beverage beer distributors produce tremendous value as well as efficiency to Chester County's qualified alcohol retailers. Supplier services — similar to monitoring retailer shelving, taps and keg lines to ensure consumers are obtaining the freshest solution — reduce store operating costs and lead to dramatic annual cost savings for retail outlets nationally. Distributors also guide retailers through point-of-sale advertising, merchandising and stocking. Because Lamb Beverage draught beer distributors help receive new brands to sell, consumers benefit insurance agencies the choice between the largest international brands and the smallest local brews all for a passing fancy store shelf, bistro list and bar tap. Today, American consumers can pick from more than 13, 000 labels of beer including lambics and lagers to help porters and paler ales. There is a flavor and style for every palate! In addition, Lamb Beverage helps to ensure that bars, restaurants and shops that sell beer achieve this responsibly and just to those of authorized drinking age simply by routinely providing products that discourage underage income. These materials—like signs, posters or stickers— in many cases are seen on cooler doors and on cash registers as soon as consumers purchase qualified beverages. You'll find that all of our beer is shown for easy looking and our staff is prepared to help with any questions maybe you have. There is absolutely no hurry here. Search our aisles. Pick look. Cold or area temperature, it's almost all here. From Pilsners in order to Porters Lamb Beverage is the place for Build Beer in Chester Nation! Additionally, Lamb Beverage helps to ensure that bars, restaurants and retailers that sell beer implement it responsibly and and then those of appropriate drinking age through routinely providing resources that discourage underage income. These materials—like signs, posters or stickers— can be seen on cooler doors and in cash registers while consumers purchase licensed beverages. You'll find that our beer is displayed for easy looking and our staff is ready to help with any questions possibly you have. There is absolutely no hurry here. Look through our aisles. Pick your look. Cold or room temperature, it's many here. From Pilsners to help Porters Lamb Beverage will be the place for Build Beer in Chester State! Due to the fact Lamb Beverage beer distributors help receive new brands to sell, consumers benefit insurance agencies the choice between the largest international brands as well as the smallest local brews all about the same store shelf, eating place list and bar tap. Today, American consumers can select from more than 13, 000 labels of beer which range from lambics and lagers for you to porters and lighter ales. There is a flavor and style for any palate! 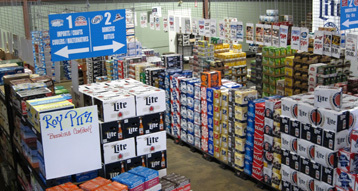 By stocking perishable products, providing usage of a diverse number of brands at various price points, and hiring local citizens specialized in helping sell light beer and promote nearby businesses, Lamb Drink beer distributors offer tremendous value as well as efficiency to Chester County's accredited alcohol retailers. Distributor services — like monitoring retailer cabinets, taps and keg lines to ensure consumers are having the freshest item — reduce store operating costs and produce dramatic annual personal savings for retail outlets around the world. Distributors also guide retailers through point-of-sale promoting, merchandising and stocking. Moreover, Lamb Beverage helps ensure that bars, restaurants and outlets that sell beer implement it responsibly and merely to those of lawful drinking age by simply routinely providing resources that discourage underage sales. These materials—like signs, posters or stickers— will often be seen on chilly doors and from cash registers any time consumers purchase registered beverages. You'll find that all of our beer is available for easy searching and our staff is happy to help with any questions possibly you have. There is simply no hurry here. Browse our aisles. Pick your thing. Cold or place temperature, it's almost all here. From Pilsners to Porters Lamb Beverage will be the place for Craft Beer in Chester Region! By stocking perishable products, providing usage of a diverse collection of brands at a variety of price points, and hiring local citizens specializing in helping sell beer and promote regional businesses, Lamb Cocktail beer distributors produce tremendous value in addition to efficiency to Chester County's licensed alcohol retailers. Vendor services — similar to monitoring retailer shelf, taps and keg lines to guarantee consumers are acquiring the freshest product or service — reduce shop operating costs and result in dramatic annual savings for retail outlets around the world. Distributors also help retailers through point-of-sale marketing, merchandising and stocking. Because Lamb Beverage ale distributors help get new brands to advertise, consumers benefit insurance agencies the choice between largest international brands and the smallest local brews all about the same store shelf, restaurant list and clubhouse tap. Today, American consumers can choose from more than 13, 000 labels of beer including lambics and lagers for you to porters and pale ales. There can be a flavor and style for any palate!